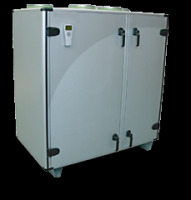 In situations with very limited space and low air flow requirements, a ZPAZE-matrix unit is the perfect choice. The rotary heat exchanger combined with speed-controlled EC motors for the fans and bag filters with low pressure drops ensure high thermal efficiency and low energy consumption usage. The two largest sizes can be supplied in parts to enable transport through extremely narrow passages. These units are delivered prefabricated. The compact size makes them particularly well suited to renovation projects. With its rotary heat exchanger, ZPAZE-matrix suits most building types where the unit is to supply areas used for similar operations. The ZPAZE-matrix series is designed for indoor installation in a fan technical room. Relevant documentation for the ZPAZE-matrix series can be found here.